CSS supports the US Geological Survey (USGS) in the management and conduct of field operations designed to provide the scientific framework to control the invasive brown tree snake (Boiga irregularis) on the island of Guam. 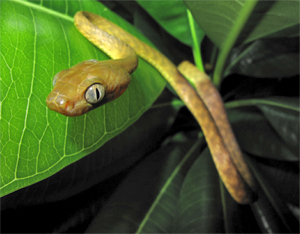 The brown tree snake was accidentally brought to Guam after World War II, and has had devastating effects on both the ecology and the economy. Past research developed and validated various control techniques, including trap and barrier designs. Current research involves two investigative approaches. One approach, using a 5-hectare fenced study area, monitors individually marked snakes over the course of months and years to evaluate interactions between prey numbers, snake density, growth rates, reproduction, and survivorship. The second approach involves the capture of snakes at 18 sites representing various habitat types throughout Guam, including native and non-native forests, grassland, and urban settings. Demographic and morphological data are collected and analyzed to provide management agencies with critical information as they implement landscape-wide control measures. CSS personnel also assist the USGS Rapid Response Coordinator in investigating potential brown tree snake sightings on other Pacific Islands. Such efforts can trigger localized eradication programs before widespread ecological damage occurs.